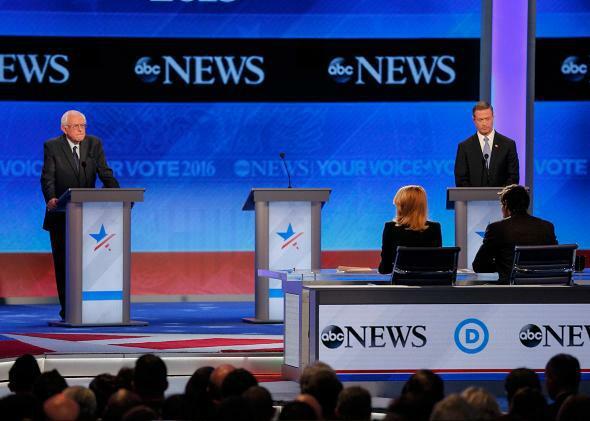 Hillary's podium empty as ABC starts debate segment. Bernie Sanders, an empty podium, and Martin O’Malley. At the first Democratic debate, Hillary Clinton made a funny reference after one commercial break to requiring more time in the bathroom than her male counterparts. During Saturday night’s Democratic debate in New Hampshire, Clinton was running late again returning from a commercial—it’s not clear whether a bathroom was involved—and ABC decided to just start without her. She returned as Bernie Sanders was speaking. It was a little odd!